The force of a window strike at this home left behind the clear imprint of a Mourning Dove. Countless collisions like this take place daily across North America, killing perhaps a billion or more birds a year. And high-rise buildings are not the only culprit. Far more birds are killed by low-rise buildings and homes, because there are so many of them. Researchers are currently experimenting with special window treatments and glass to help reduce the number of collisions. Photo by Charles Bradley. The latest U. S. numbers come from Scott Loss of Oklahoma State University. He and collaborators at the Smithsonian Conservation Biology Institute and U. S. Fish and Wildlife Service just published a two-year study in The Condor: Ornithological Applications in which he calculated the overall death rate from window strikes. Based on the data, Loss believes the total could be as high as 1.3 billion birds killed each year. To come up with the latest figures, Loss extracted data from 23 existing studies. “We used both peer-reviewed publications and unpublished data collected by citizen scientists engaged in building monitoring programs in large cities,” Loss explains. He also looked at building types. Although bird kills at high-rise buildings get much of the attention, Loss finds that the vast majority of annual bird deaths can be traced to residential and low-rise structures. An average single-family residence is estimated to kill one to three birds each year, but when you multiply that figure by the huge number of homes in this country, Loss says a midrange estimate of 253 million bird deaths can be attributed to houses. The correct application of BirdTape to a windows can reduce bird strikes. Photo by Darius Zdziebkowski. Studies have shown that homes with feeders can have more bird deaths from window strikes, so it’s vital to place feeders a foot or less away from windows, which will lessen the chance that the birds will gain enough speed to be killed or injured if they do hit the glass. Even then it is important to reduce reflections, because birds may fly from longer distances to feeder reflections and gain enough momentum to cause serious harm or death. Use the “2 x 4 rule” to apply decals, paint, hanging strings, soap, or tape, such as ABC’s BirdTape: vertical rows placed four inches apart, or horizontal rows placed two inches apart. Decals don’t have to reflect UV light because it’s the pattern and spacing that matters. Shape is also irrelevant. “If you go the tempera paint route, you can make it a fun, family activity,” ABC’s Christine Sheppard suggests. “Paint the windows for the next holiday—hearts on Valentine’s Day, turkeys at Thanksgiving, witches on Halloween.” Even doing this only during migrations will save some birds. Fine netting placed over windows is also effective, as are regular window screens. In many large cities, you can volunteer for collision-monitoring programs. You could also consider starting up your own monitoring program if one does not exist nearby. Areas west of the Mississippi are underrepresented in the data, according to Scott Loss, of Oklahoma State University, who has developed a “best practices” document for creating a monitoring project. Following the guidelines ensures your data will be useful and can be compared with other study sites. Visit http://scottrloss.wix.com/losslab to download the guidelines. Anyone can participate in a University of Alberta window collision citizen-science project now underway. Visit http://birdswindows.biology.ualberta.ca/. The estimated annual range of bird mortality remains very broad for both low- and high-rise buildings. That’s because a complicated tapestry of environmental and structural variables gives each building its own unique potential to kill birds. “A major part of our study was also to see which species were disproportionately vulnerable to collisions,” says Loss. 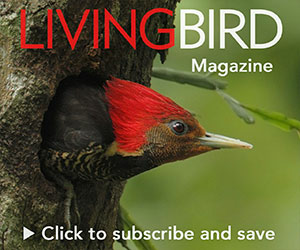 After controlling for the abundance of a species in a given location, Loss found six that seemed to strike windows more often than would be expected by chance at every building type: the Ruby-throated Hummingbird, Brown Creeper, Ovenbird, Yellow-bellied Sapsucker, Gray Catbird, and Black-and-white Warbler. Neotropical migrants were found to be more vulnerable at low- and high-rise buildings, possibly because of exposure to more structures along their route, unfamiliarity with a location, and attraction to buildings that are kept lit at night. 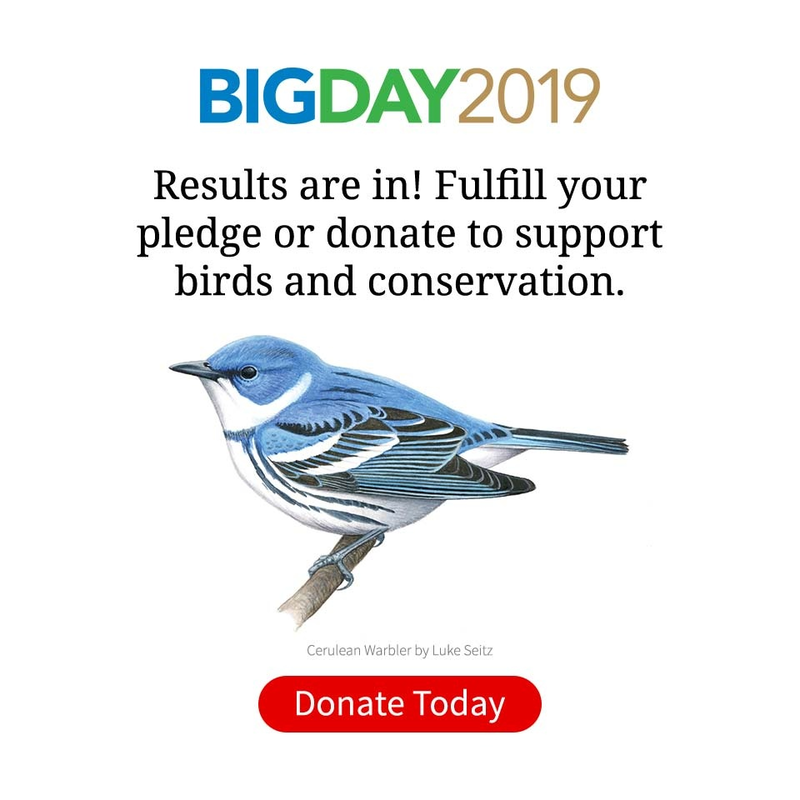 Some of these vulnerable species are listed as threatened or have declining populations, Loss points out, including the Golden-winged Warbler, Painted Bunting, Canada Warbler, Wood Thrush, Kentucky Warbler, and Worm-eating Warbler. Two properties of glass make it lethal for birds. Glass can appear completely transparent. Glass walkways between buildings are especially deadly because birds spot greenery on the other side and try to fly straight through. Glass can also be a mirror, reflecting the sky and surrounding vegetation, creating the illusion that the habitat continues. Some glass manufacturers are now glazing windows with patterns that reflect ultraviolet light, which most birds can see—an important exception being raptors. Evaluating the effectiveness of these new glass types is complicated. Building orientation, weather, time of day, time of year, landscaping, inside light levels, and other factors all influence how birds perceive glass and any patterns applied to it. An early developer of commercial bird-friendly UV glass is ArnoldGlas of Germany. Their Ornilux product was introduced to North America a few years ago, although it is currently only manufactured in Europe. The most recent version, Ornilux Mikado, uses a random “pick-up sticks” pattern of UV-reflecting and UV-absorbing glaze to break up reflections to reduce bird collisions. UV light must be reflected for a bird to see it. To humans, the glass looks clear. A pioneer in the study of bird window collisions, Daniel Klem, Jr., developed a tunnel to test window treatments. Photo by Peter G. Saenger. Does it work? 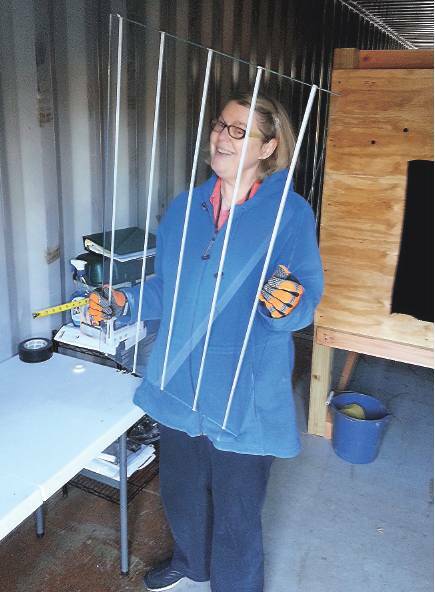 Christine Sheppard heads the Bird Collision Campaign for the American Bird Conservancy (ABC) and has tunnel-tested Ornilux Mikado at the Carnegie Museum’s Powdermill Avian Research Center, near Pittsburgh. In those tests Sheppard says the Ornilux UV glass was “moderately effective.” Klem field-tested Ornilux Mikado but found no significant difference in the number of bird strikes as compared with a regular glass pane and a reflective glass pane used in the experiment. Though Klem believes tunnel-testing is a valuable way to assess collision-prevention methods quickly, he says complementary outdoor field-testing is essential. In a recent scientific paper in The Wilson Journal of Ornithology, he says tunnel tests address the transparency problem but not the reflective property of glass and cannot simulate windows in actual buildings the way field tests do. Christine Sheppard heads the American Bird Conservancy’s Bird Collision Campaign. Here, she prepares to test a patterned window glass in her new test tunnel at the Bronx Zoo. Photo by William Haffey. Meanwhile, Sheppard is working to improve tunnel protocols and testing a brand new tunnel built inside a large metal shipping container on the grounds of the Bronx Zoo. Some of the information she’s hoping to gather includes whether birds see and react to netting placed in front of the windowpanes to prevent bird deaths during tests. She’s also looking into whether a daylight simulator will provide more accurate results compared with light bounced off mirrors. Klem found that most birds will avoid windows with a pattern of vertical stripes spaced four inches apart, or horizontal stripes spaced two inches apart and placed on the outside of the glass. Sheppard has also tested an insulated glass product that has a pattern of 1/8 -inch white ceramic dots, or “frit,” on the inside surface of the window. With 20 percent of the glass covered with an array of dots, she found 59 percent of the test birds did not fly toward that window, but to the clear, untreated pane; with 40 percent window coverage, 75 percent of the test birds stayed away from the patterned pane. When dots were consolidated as 1/8-inch-wide vertical or horizontal lines separated by a 1/2-inch, more than 90 percent of birds flew toward the clear control pane. Sheppard says arrays are harder for birds to see than lines. Research by Klem in 1979 and in 1990 produced the so-called “2 x 4” rule governing how patterns may best be applied to glass to deter bird collisions. He found that most birds will avoid windows with a pattern of vertical stripes spaced four inches apart, or horizontal stripes spaced two inches apart and placed on the outside of the glass. Inside patterns can be completely obscured by strong reflections on the outside surface of the window. The Ornilux Mikado UV-patterned glass is one kind of window collision-avoidance glass. Photo courtesy of Arnoldglas. Window glass using horizontal stripes is another kind of collision-avoidance glass. Photo courtesy of Martin Rossler. These pattern results were later duplicated with European birds in studies done by Martin Rössler of Austria. He also found the most effective pattern to be Plexiglas with embedded horizontal polyamide filaments placed 28mm apart. Rössler and his coauthors concluded that this pattern was highly effective even though it covered only 6.7 percent of the glass surface. The Green Building Council is now pilot-testing a new LEED credit that requires a building’s design to include window-strike deterrents to protect birds.Though still in its beta stage, the Council says that, as of this writing, 56 applicants have implemented or are attempting to implement the credit in their projects, and at least another 52 projects are in the pipeline. However, Klem worries that bird-friendly industry standards for glass are based entirely on tunnel-testing results, and he continues to advocate adding field testing before drawing conclusions about effective ways to prevent collisions. In Canada, a nonprofit group of environmental lawyers called Ecojustice is using the stick approach. They are filing lawsuits against building owners, charging them with violating the country’s Species at Risk Act and provincial laws protecting birds. Ecojustice sued Cadillac Fairview, owner of a north Toronto office complex, accusing the company of violating the Ontario Environmental Protection Act because of bird collision deaths. The judge eventually dismissed the case after Cadillac Fairview installed anticollision film on its windows but agreed that window kills violate Canada’s environmental statutes protecting birds, setting an important legal precedent. Klem believes the same legal tactic must be part of the fight in the United States. Though inroads are being made in large-building design, it is equally vital to focus on residential construction. “There may be only a few birds killed at each home per year,” says Klem, “but the killing adds up, it goes on year round, and it is indiscriminate, taking healthy birds out of the population.”There’s also unknown “collateral” damage when adult birds are killed during the breeding season and cannot return to their nest to feed and care for their chicks. There are simple ways to reduce window strikes at existing homes.